A friendly, knowledgeable, and gentle pediatric dentist in Mission Viejo is your child’s best friend. While many adults don’t like visiting the dentist, children are not born with this fear. Therefore, it’s important to set a positive tone from their very first visit. When they go for their first dental appointment here at Aria Dental, we want them to feel relaxed and excited about getting their teeth checked. When Is the Right Time to Visit the Dentist? Trust our pediatric dentists to work closely with you as you lay down the foundations of good oral hygiene for your little one. Many children struggle with tooth decay, but it’s fairly easy to prevent this. As early as possible, build proper brushing and flossing habits, and take them for regular dental cleanings and check-ups every six months. Children’s teeth have deep grooves that attract decay. 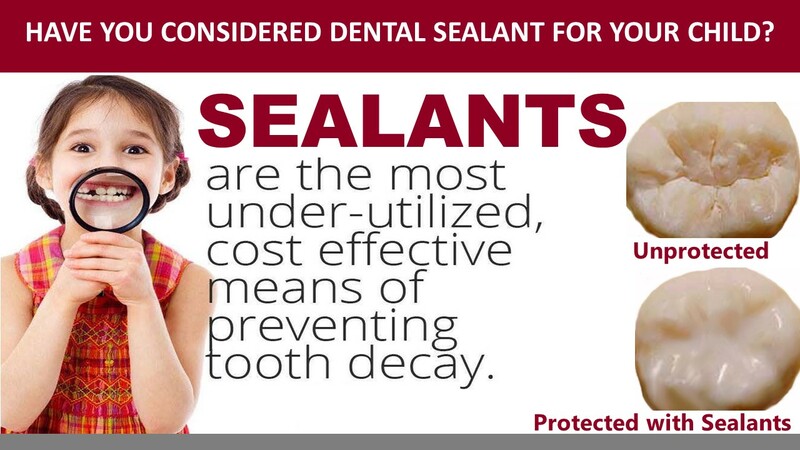 Sealants offer an affordable and highly effective way to seal these grooves and strengthen teeth. Sealants can last for years, and we'll monitor them during check-ups. All it takes is a few minutes several times a year to prevent tooth decay, cavities, and plaque build-up. Go in for quick fluoride treatment and leave our clinic with better oral health! An excellent and safe choice for children two years old or older. Our in-house sedation services use Nitrous Oxide or Laughing Gas to keep younger patients calm throughout their procedure — no stress, no pain, no fuss! Does your child’s smile need correction? Our orthodontists will help you explore the right treatment for your child or teen. Getting the perfect smile has never been this fun or easy! Painless, gentle, and caring, every child is in good hands with some of Mission Viejo’s most respected dentists. This is just the start of our comprehensive pediatric services, so please feel free to set-up an appointment or call us to learn more! At Aria Dental, we treat everyone like family! Our courtesy is not just reserved for our adult patients, but all of our young guests as well. Feeling a bit thirsty? Refreshing drinks like fruit juice are served at our concierge. The fresh, cool ambiance of our dental office is sure to put any worries to rest. When the moment comes for their treatment or procedure, a massaging dental chair keeps them cozy from start to finish. We also have ceiling flat screens and hundreds of movies for them to watch using wireless headphones, making them feel right at home. We can’t wait to meet our newest guests. Schedule you’re child’s next dental appointment here at Aria Dental!